Have I mentioned how much I love Roadside Americana postcards? I especially love older amusement park cards. I am so happy to have collected a huge box of amusement park postcards, and I'm going through them and listing them individually on eBay. It is neat to read about the history of the different amusement parks and theme parks. This beautiful card is called Shooting the Chutes, San Francisco, California. I did some research and found out this card was from Playland amusement park. 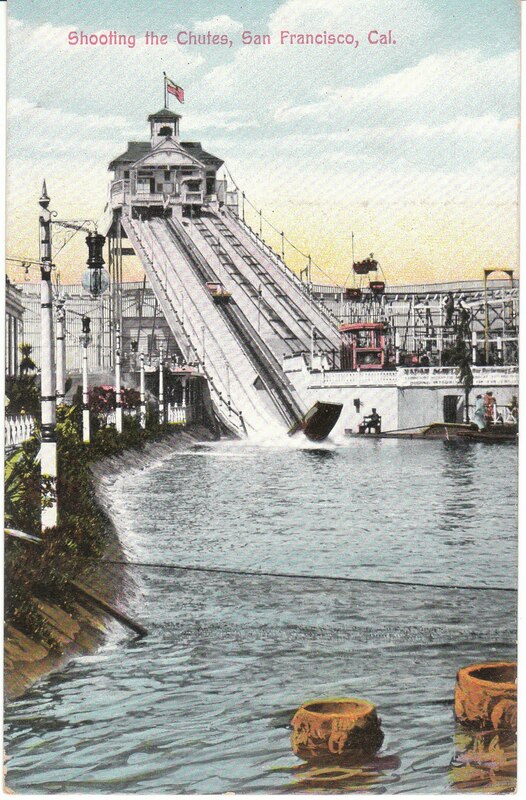 This old amusement park was started in the early 1900's and was torn down in 1972. Shoot the Chutes, the ride pictured in this card, was a bit like a log flume ride. This ride began in the early 1900's (and the card pictured is early 1900's vintage as well) and was demolished in 1950.